Cell activity patterns of two gene enhancers (red and green cells). Cells in which both enhancers are active appear yellow. (Credit: Marco Osterwalder). Every cell in the body has the same DNA and genes, so a cell’s properties and functions are determined by which genes are turned on. That’s why it is critical to understand enhancers, short sections of non-coding DNA that regulate the expression of specific genes. An enhancer doesn’t have a one-to-one relationship with the gene it controls. Instead, there are many more enhancers than genes and their relationship is unclear. Do many enhancers regulate a given gene’s expression in a given tissue, providing redundancy? Researchers at the Department of Energy’s Lawrence Berkeley National Laboratory (Berkeley Lab) investigated this question, and the overall importance of enhancers to development, in two recent studies. The researchers answered a long-standing question about the role of enhancers. And by better linking the genomic complement of an organism with its expressed characteristics, their work offers new insights that further the growing field of systems biology, which seeks to gain a predictive understanding of living systems. In their new study published in Cell, the team investigated enhancers containing “ultraconserved elements,” which are at least 200 base pairs in length and are 100 percent identical in the genomes of humans, mice and rats. Ultraconserved elements have been perfectly conserved for over 80 million years since these mammals shared a common ancestor. Previously, the group individually deleted four ultraconserved brain enhancers in the mouse genome. All four mouse lines were viable and fertile, which shocked the genomics and evolutionary biology research communities who thought these enhancers were critical for life since they have been so perfectly conserved. 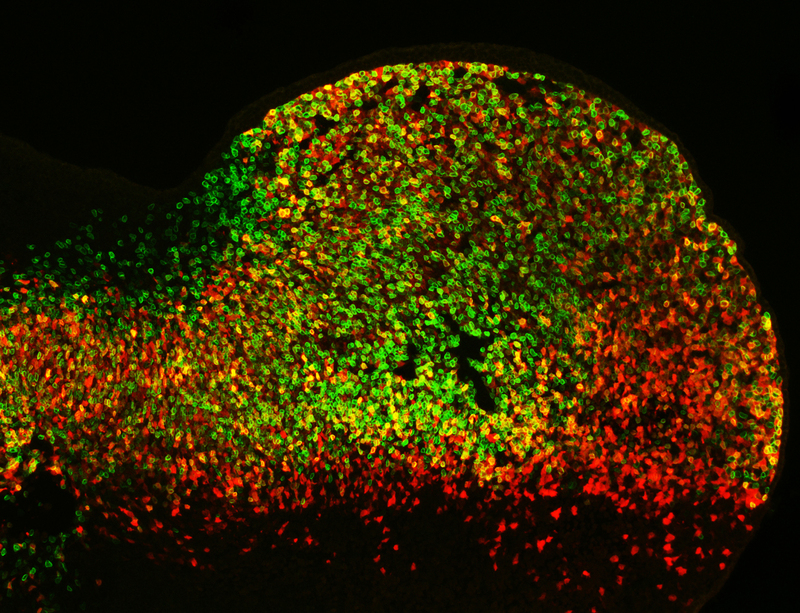 In the new study, the team used the gene-editing tool CRISPR-CAS9 to further investigate enhancers near the Arx gene that, when defective, cause neurological and sexual-development disorders in mice and humans. “We focused on Arx because it has an unusually large number of very long ultraconserved sites nearby,” said Dickel who co-led the studies with Len Pennacchio and Axel Visel, both senior scientists in the same division. Specifically, they knocked out four of Arx’s brain enhancers, which are active in pairs in either the top or bottom of the forebrain. When these enhancers were individually deleted, all the mice were viable and fertile — confirming that ultraconserved enhancers aren’t essential to life within a given generation. When they were deleted in pairs with similar activity, the mice were still viable and fertile — ruling out redundancy as the primary explanation for the absence of major defects upon knockout of individual ultraconserved enhancers. But were there more subtle brain defects? To answer this question, the researchers teamed up with John Rubenstein, a neurobiologist at UC San Francisco, who provided in-depth neurological phenotyping. In three of the four cases with only one enhancer deletion, they found abnormalities —either in overall growth or brain development. In one case, the mice had a severe structural defect in the hippocampus. In another case, the mice had fewer cholinergic neurons. While there are only a few hundred ultraconserved sites in the human and mouse genomes, there are also approximately 100,000 other, less well-conserved enhancers. The defects observed upon deletion of individual ultraconserved enhancers raise the question if deletion of less well-conserved enhancers generally causes similar problems. Are defects the exception or the rule? This question was investigated in a second study, led by postdoctoral researcher Marco Osterwalder, which focused on enhancers for limbs. Limb enhancers were targeted because limbs are easy to assess, unlike neurological phenotyping. As reported today in Nature, the team deleted ten limb enhancers near genes essential for limb development. They expected to see some anomalies but all ten mouse lines had perfectly normal-looking limbs. To determine whether or not it’s common to have such a regulatory back-up system, the team computationally analyzed genomic datasets from many different tissues. They determined that genes that control central processes in embryonic development are commonly equipped with sets of enhancers that are likely redundant. In more than 1000 extreme cases, they found sets of five or more enhancers with similar activity patterns controlling the same gene. Despite the redundancy, these enhancers are evolutionarily conserved, which leads the scientists to surmise that disrupting these enhancers may cause some sort of decrease in fitness in the wild, even if it is so small it can’t be readily detected in the lab. Complex questions such as these are addressed by biological systems science, where these results can be used to understand the effects of genetic perturbations on inherited and expressed characteristics in a larger context. Ultimately, the team is interested in whether enhancer mutations contribute to human disease. “With whole human genome sequencing now a reality, we are focusing on studying how human mutations impact health and development in vivo,” Pennacchio said. The research, funded by the National Institutes of Health, was performed at Berkeley Lab and is a natural evolution of the work that was begun by the DOE and became the Human Genome Project. The following Berkeley Lab researchers also contributed to the studies: Iros Barozzi, Yoko Fukuda-Yuzawa, Brandon Mannion, Sarah Afzal, Elizabeth Lee, Yiwen Zhu, Ingrid Plajzer-Frick, Catherine Pickle, Momoe Kato, Tyler Garvin, Quan Pham, Anne Harrington, Jennifer Akiyama and Veena Afzal. Also participating in the research were scientists from the University of California San Francisco, University of Basel, and the Centro Andaluz de Biología del Desarrollo. This is a reposting of my news release, courtesy of Berkeley Lab.